After bringing the SSL/TLS Cipher Suites Setup up to date on our NetScalers it's now time to take a closer look at a few of those HTTP Security Headers (X-Xss-Protection, X-Frame-Options and X-Content-Type-Options) and how to implement them on the NetScaler ADC. For an in depth Explanation what those different Headers really do I will refer you to the excellent Blog from Scott Helme who can explain those Things a lot better than me. So if you are fronting your Webservers with a NetScaler or you want to enhance the Security of your NetScaler Gateway (formerly also known as Citrix Access Gateway) you might want to implement those HTTP Headers on the NetScaler itself and not directly on your Webservers. The following Guide and Screenshots were written/taken while using the NetScaler 11.0-63.16.nc Firmware and using the GUI. If you prefer the CLI, all of the needed Commands for adding the 3 Rewrite Rules can be found at the end of the Blogpost. We will create a new Rewrite Action for inserting the X-Frame-Options Header in the GUI under AppExpert -> Rewrite -> Actions -> Add. Next we will choose a Name for the new Rewrite Action and then select "INSERT_HTTP_HEADER" as the Type. Under Header Name we need to put X-Frame-Options and under Expression we will put "SAMEORIGIN" or "DENY" (depending on your Use Case). 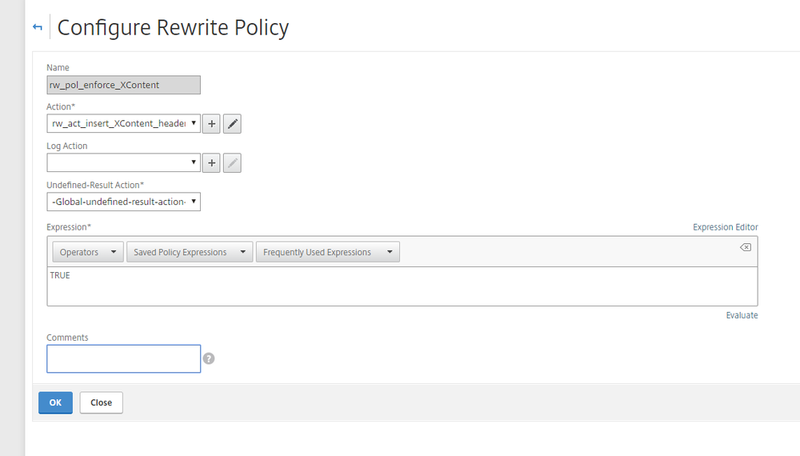 In the next Step we need to create the Rewrite Policy itself in the GUI under AppExpert -> Rewrite -> Policies -> Add. Name the Policy accordingly and under Action select the Rewrite Action we created a Step earlier. As Expression you can use TRUE which will force the NetScaler to always insert the HTTP Header as long as the Policy is being hit/used. Next Step is to bind the newly created Rewrite Policy to the vServer (or NetScaler Gateway) of your choice. In my example I'm binding it to one of our NetScaler Gateways as a new Response Policy. Important: If you already have existing Rewrite Policies bound to your vServer and you want them all applied make sure only the last Rewrite Policy (with the highest Priority Number) is using END as the Goto Expression or NetScaler will stop applying your Policies as soon as he hits the first Rewrite Policy with an END Goto Expression. Reminder: NetScaler is going through those Policies from the lowest to the highest Priority Number and depending on the GoTo Expression after starting with the lowest Policy will either continue (Goto Expression: NEXT) with the next higher Policy or just stop going through all of the remaining Policies (Goto Expression: END). Now it's time to check if we did everything correctly and if all our existing and new Rewrite Policies are still being applied. If your Website (where we bound the new Rewrite Policy) is publicly available you can use the securityheaders.io Site to check if the new HTTP Header is present (note the green X-Frame-Options Badge in the Screenshot). Otherwise you would need to use the "Developer Tools" of your Browser to check if the HTTP Response Headers are being added. Now we need to repeat the whole Process for the other 2 HTTP Headers (X-Xss-Protection and X-Content-Type-Options). First we create a new Rewrite Action with the X-Xss-Protection Header Name and the Expression Value set to "1; mode=block"
And a new Rewrite Policy for the corresponding Rewrite Action. Again using TRUE as Policy Expression. And again bind the newly created Policy. Again, pay attention to your Priority and Goto Expression. And after binding the Policy and saving the running Config make sure the new Policy is working. We should now also see a green Badge with a Checkmark next to the X-Xss-Protection Header in the Test. And now onto the last HTTP Security Header X-Content-Type-Options. Again create a new Rewrite Action with the Header Name Value of X-Content-Type-Options and the Expression Value set to "nosniff". Your 3 new Rewrite Actions and their corresponding Rewrite Policies should now all be listed in the GUI. And again testing with all 3 new Policies bound it should look something like this in the securityheaders.io Test. Implementing Content Security Policy (CSP) on NetScaler is reserved for another Blogpost in the future. add rewrite action rw_act_insert_XFrame_header insert_http_header X-Frame-Options "\"SAMEORIGIN\""
add rewrite action rw_act_insert_XSS_header insert_http_header X-Xss-Protection "\"1; mode=block\""
add rewrite action rw_act_insert_XContent_header insert_http_header X-Content-Type-Options "\"nosniff\""
Thanks again to Scott Helme for writing the great securityheaders.io Site and for providing a lot of Background on those Headers in his Blogposts. Feel free to leave a Comment with Feedback or Questions, thanks!